While the renovations are being completed on our 745 Vermont location, you can find us at the Peaslee Technical Training Center located at 2920 Haskell Ave. This location is easy to access via the South Lawrence Trafficway. 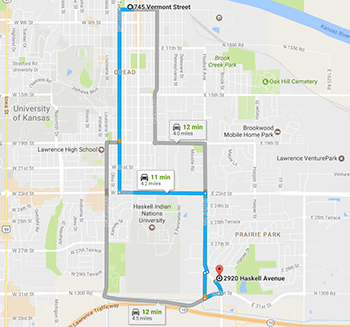 We have a dedicated stop using the Lawrence Transit system via Route 15 which runs directly from downtown, with a stop across the street from the Lawrence Public Library. Our temporary location is just 4 miles from downtown. From the Parking Garage, head South on Tennessee to 23rd St. At 23rd St, turn left. Take 23rd St to Haskell Ave. At Haskell Ave, turn right. 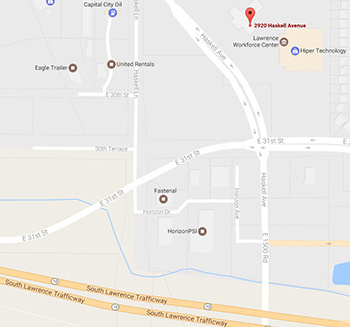 Follow Haskell Ave to 29th St. Take a left at the Peaslee Technical Training Center entrance. Follow the drive around to the right. This will lead you directly to our new dedicated entrance. Take the South Lawrence Trafficway to the Haskell Ave/ E 1500 Rd exit. Turn right on Haskell Ave and head North. At 29th Street, turn right. Follow the drive around the curve and follow the SRC signs directly to our dedicated entrance, located on the West end of the Peaslee Tech building. The Lawrence Transit buses run directly to our front door at Peaslee Technical Training Center. 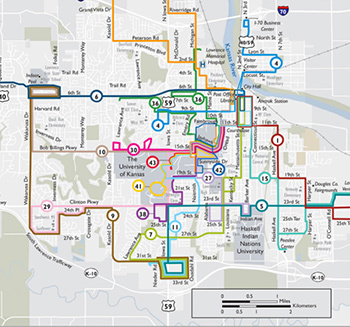 Utilize Route 15 initiating just across the street from the Lawrence Public Library.